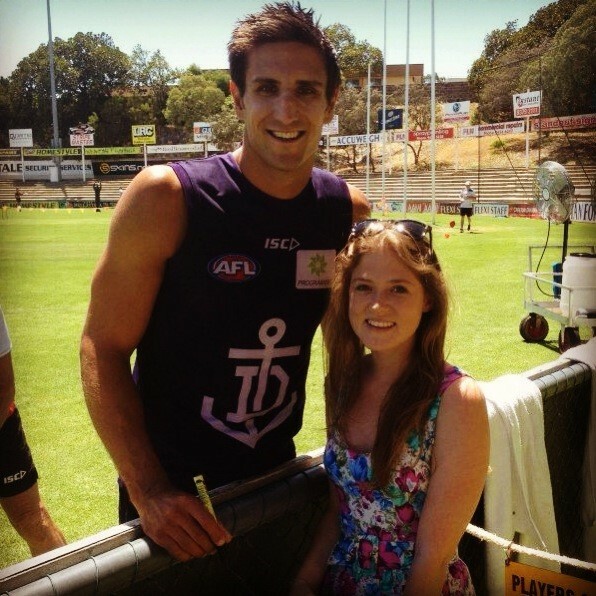 Matthew Pavlich, The Pav, The Thighs, Super Pav. It doesn’t matter what you call him, they all mean the same thing – Fremantle. Pav is a bloody good player. He’s a six time Best and Fairest at the club and a six time All Australian across all lines, he finished second in the Coleman Medal in 2012 and has played 353 of the best games anyone has ever seen, but none of that is why I love Pav. While he’s a bloody good player, he’s an even better bloke. I remember being young and heading down to the club merchandise shop to buy a badge, and the team was training. Pav was standing near the fence talking to a member of the coaching staff and I was instantly starstuck. He noticed me gawking at him and smiled, waved and said ‘It’s such a beautiful day isn’t it?’ By this point I had pulled myself together and we had a short chat followed by me blurting out that I would like a photo – to this day it’s one of my favourite pictures. On the field, the man is a machine. I will never forget having just turned 18 and heading to the pub to watch the 2012 Elimination Final against Geelong at the MCG. In 120 minutes Pav destroyed Geelong kicking 6 goals, each better than the last. He always saw the big moments coming and seized them with both hands. As he ran through the 353rd and final banner of his career a wave of emotion swept through Domain Stadium and it dawned on me that in three hours Freo would be Pav-less. The game didn’t begin according to the script; Pav dropped mark of the year and all the scoring was at the Bulldogs end. I began to fear it would be a long day. It didn’t take long for the great man to get the crowd to their feet – a huge tackle in the middle of the ground received a massive roar and a free kick. Moments later Shane Yarran found himself dishing off the most important handball of his short career, over the top to Pav and the greatest Docker of all time kicked his 700th goal. Every player got down to him, and rightly so, with the crowd roaring in delight to pay The Pav the respect he deserves. From that moment on the atmosphere changed, it was like Carnivale in Rio. The players were more than competent, they were great. The ball movement was no longer static and inaccurate, it was fast and smooth. We got our pressure back; our fight and you can’t help but think it had something to do with the occasion. Pav seemed to take himself on a journey through the ages. He was spotted helping out in the backline, then sorting out Freo’s clearance problem in the middle and of course, taking big marks and kicking big behinds in the forward line. When the siren finally called time on Pav’s career he was standing directly in front of our seats and you could almost feel the relief oozing out of him. His work was done. It was time to pass the torch. As he did his final lap of Domain stadium 35,000 people stood and thanked the great man for everything he has done for our club. For being our captain, for taking us to the big dance, for staying when he could have gone home and most of all for just being Pav. Matthew Pavlich is more than a good footballer, or a great leader, he is an absolute champion bloke. Thank you Pav, from the bottom of my purple beating heart. It was a great last game, made even better because the boys lifted for him, and won! I admit to a few shouts of “Kick it to Pav”! A few tears, but happy for him too. Absolutely enjoyed reading your post, I really liked the way you added to your tribute with your photograph, the entire post was a fantastic way to emphasise the greatness of the bloke at the end of his stellar career, what a role model he was for all Australian sportspeople both on and off the field. Great piece Poppy, lovely sense of rhythm. Matthew Pavlich for the cover. Purple anchor strip.